Read on for parking details and other instructions for Parents' Day on Monday, Nov. 19 and Grandparents & Special Friends’ Day on Tuesday, Nov. 20. Click here to register so that your child's guests can have name tags and accessible seating. Excitement is building with each rehearsal for our Parents' Day at 1 p.m. Monday, Nov. 19 and Grandparents & Special Friends’ Day at 9:30 a.m. Tuesday, Nov. 20. We look forward to celebrating with you and your guests in the Sperling Gym. In order to guarantee space for everyone, parents and siblings should attend the Parents’ Day performance so that grandparents and friends will have enough seating the following day. Invitations will be sent home with Lower School children soon. Click here for guest registration before Monday, Nov. 12 to ensure grandparents and special friends have name tags with instructions on best seating to see their grandchildren as well as accessible seating for guests with disabilities. Parents’ Day parking is available at Vanderbilt University Lot No. 77 located on 18th Avenue across from the Kennedy Center. Shuttle service will be available between the parking lot and USN. Grandparents & Special Friends’ Day parking is available in the 19th and 21st Avenue parking lots. Additional parking is available in the Vanderbilt University lots listed below, and they will have “USN Parking” signs at their entrances. Shuttle service will be available between the parking lots and USN. Elevators are available at the Tibbott Center (accessible from the 21st Avenue parking lot), 19th Avenue Entrance, and Hassenfeld Library. 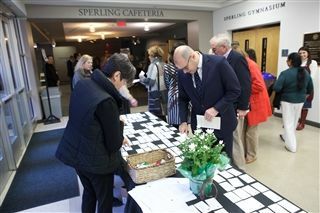 They will be marked with signage, and ushers will be present to assist guests. One hour prior to the Grandparents & Special Friends’ Day performance, a reception hosted by USNA will be held in the Sperling Cafeteria. On Grandparents & Special Friends’ Day, seating will be color-coded according to each student's teacher. We encourage guests to select seating corresponding to the youngest child’s class. For optimal viewing, ask your student to tell you his/her assigned line number. This will help select your seat. 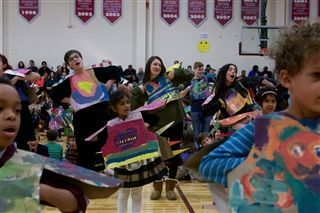 On Parents' Day, students will return to their classrooms following the performance, and parents may sign out their children from the classroom. Dismissal in 21st Avenue garage and After-School will proceed as usual. Following the performance, grandparents and special friends are invited to meet faculty. Specific instructions to direct guests will be provided at the conclusion of the performance. Student dismissal will be completed by 11:30 a.m. After-School will not be available on Tuesday, Nov. 20. Please contact Lower School Administrative Assistant Diane Gigliotti at 615-321-8022 with questions and concerns. The Turkey Trot featuring kindergartners and seniors is always a crowd favorite. 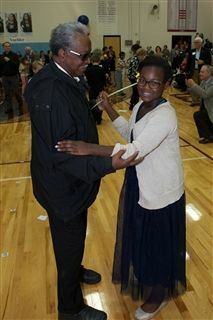 Fourth graders dance with their guests during the performance. Be sure to register guests by Monday, Nov. 12 to ensure they receive a name tag and accessible seating.